A multi-vitamin/mineral product is the starting point for every individual's supplementation needs and therefore it should contain all of the essential nutrients. A good multi-vitamin/mineral nutritional supplement could be considered "dietary insurance" to be certain all of the essential nutrients are being consumed on a daily basis. 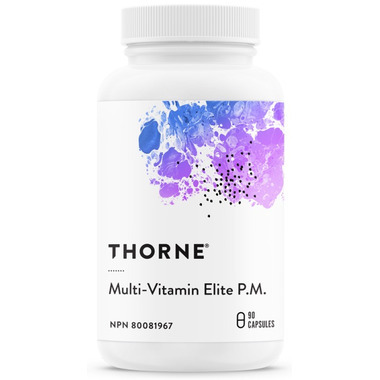 Thorne's Multi-Vitamin Elite PM formula helps boost energy during the daytime, assists in maintaining the body's ability to metabolize nutrients and provides antioxidants for the maintenance of good health. It also helps in the function of the thyroid gland and maintaining immune function. Take one capsule daily, in the evening. Take with food. Take a few hours before or after taking other medications or natural health products. For Adult Use Only. Consult your health professional prior to use if you are taking blood thinners.